The following contains spoilers from the first two seasons of the NBC sitcom The Good Place with some NFL analysis sprinkled on top. Step aside, Tom Brady. Go home, Joe Montana. There is a new GOAT in town and his name is Blake Bortles. I kid, of course, but Bortles related punchlines are seeming less and less ironic by the day. Pretty soon, the @BortlesFacts Twitter handle will be as important an NFL news account as Adam Schefter or Jay Glazer. The Jacksonville Jaguars are following up their AFC finalist 2017 campaign by starting 2018 2-0, with a convincing 31-20 in their home opener against the New England Patriots. They have a great defense and a blue chip running back in Leonard Fournette who is good enough to cover up for a less than adequate quarterback. But Fournette didn’t play in Week 2 against the Pats. This win was about Bortles. Something clicked in the middle of last season, and Blake Bortles is finally living up to the #3 overall pick the Jags used on him in 2014. Part of it was the very real early struggles for the former UCF quarterback, and part of it was that it is hard to say the name “Blake Bortles” without cracking a smile, if not cracking up. The Jaguars have used two high draft picks on what they hoped would be franchise-altering QBs, and their names were Blake Bortles and Blaine Gabbert (#10 overall, 2011). If you told me in 2010 that Blake Bortles and Blaine Gabbert were the names of background characters from the touch football scene where Bradley Cooper’s star was born in Wedding Crashers, I would have believed you. Just last summer, it looked like there was no hope for Bortles as a franchise QB, but GOAT jokes aside, he really has turned a corner, and Bill Belichick was right to compare him to elite mobile quarterbacks like Deshaun Watson and Cam Newton. 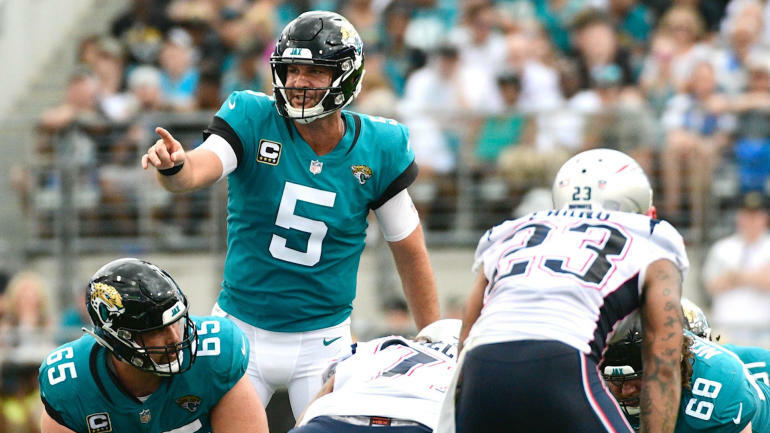 There might have been one person living or dead, real or fictional, who believed in Blake Bortles the whole time, and his name is Jason Mendoza. Jason Mendoza was a small time criminal and smaller time EDM DJ (though he would call it “pre-successful”) from Jacksonville, Florida. He is portrayed brilliantly by Manny Jacinto But the audience did not know that at the beginning of NBC’s The Good Place. When we are first introduced to the television afterlife in which the show is set, we meet him as Jianyu Li, the Taiwanese monk who is keeping his vow of silence beyond the grave. 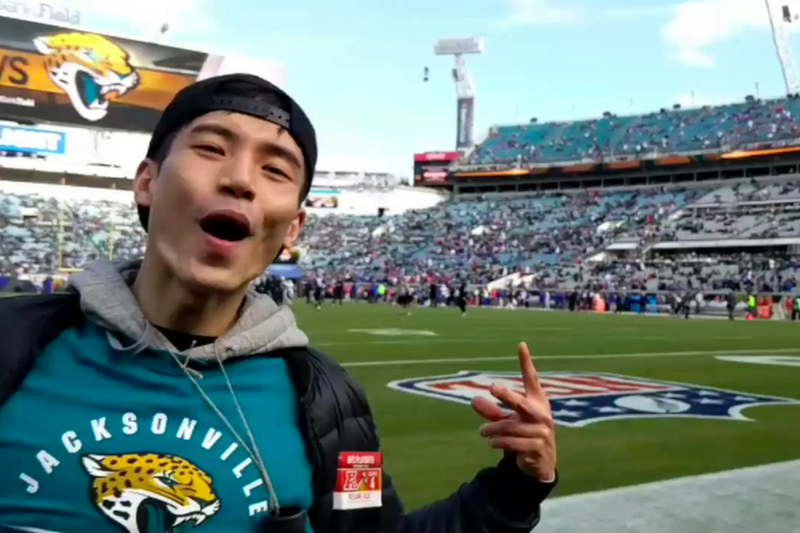 As it turns out, it is killing (pun intended) Jason that he can’t talk and he is Filipino not Taiwanese (“heaven is racist”), and the more he speaks, the more he can’t stop talking about his beloved Blake Bortles. On some level, I am surprised it took until 2016 for the Jacksonville Jaguars to become a recurring punchline on a popular or critically acclaimed sitcom. I did not appreciate this right away, but the first year I started following the NFL week-to-week was 1996 (I was six), and to more seasoned football fans, the AFC Championship Game must have been hilarious. You had the always downtrodden Patriots hosting the relatively recent expansion franchise Jaguars at the old Foxboro Stadium. The name “Jacksonville Jaguars” is one of those that people would find hard to believe if they hadn’t been paying close attention to sports for a couple years, much like how the “Oklahoma City Thunder” still sound more like a AA affiliate of the Kansas City Royals than an NBA team, and last winter when I was talking to my sister Kelly about basketball and I was like “Rajon Rondo? He’s with the New Orleans Pelicans now.” her immediate reaction was to burst out laughing and say “Wait, is that a real basketball team?” Some team names just sound silly because we have been conditioned by decades of established team names, but then again, we act like “Red Sox” and “White Sox” are perfectly normal things to call a baseball team because we have for over a century. For a while, it was weird that Jacksonville had an NFL team when Houston and Los Angeles did not, but now both of those gripes are dated. Northern Florida is a hotbed for football fandom, but its foundation has always been built on the Saturday game. The idea of an idiot like Jason Mendoza believing in Blake Bortles and talking about him like people in Massachusetts talk about Tom Brady or David Ortiz worked as a comedic bit. It made sense that a person who (spoiler alert) ended up in the Bad Place was that delusional in life, but Blake Bortles actually being good is somehow even funnier. Maybe we are all living in Jason’s version of The Good Place. You have to admit, since the show debuted in the fall of 2016, the world has gone bananas. It could have all flipped on one quarterback. The more they joked about Bortles being great because he wasn’t, the better he got. At this point, I rule nothing out.